I realize that I’ve been a bit negligent in posting on the blog but I haven’t had much to report and I have been busy cranking out the next issue of Tortilla (#5) and doing some illo gigs..plus, no one really reads this anyway. And…..I’m gonna hop back on the graphic novel train shortly as well. Oh- and finally a HUGE gracias to Javier Hernandez and Ricardo Padilla, as well as the incomparable Dr. Teresa Rojas for the Best LCE (Latino Comics Expo) EVER! It was held on the Modesto Junior College campus this past March 15 & 16 and was an incredible experience! Dr. Rojas has been teaching her classes using a lot of our (LCE cartoonists) work and it has really engaged the students. I hope to return next year! 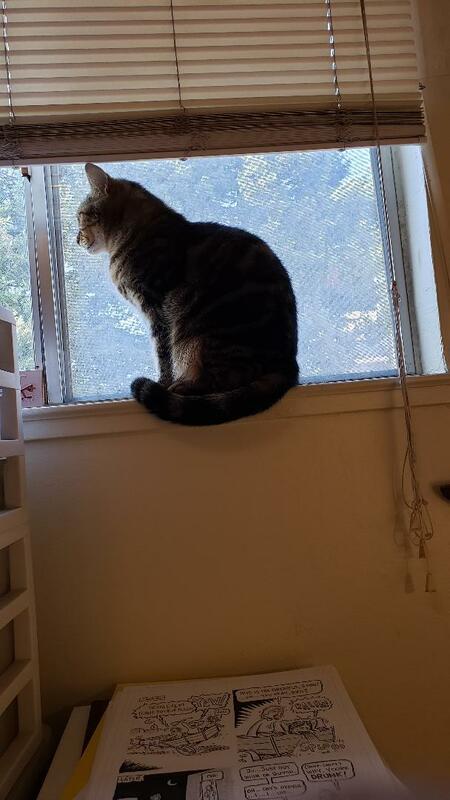 Pictured below…my co-worker, Pickles the Cat taking a break on the window sill. The Latino Comics Expo 2019!!!! That’s right! 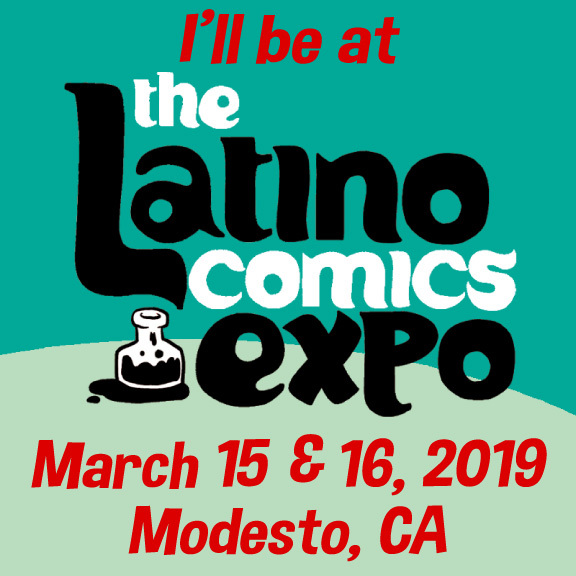 Coming up on March 15th & 16th I’ll be at the Latino Comics Expo held this year in Modesto, CA on the Modesto Community College campus! Come see your favorite and maybe not-so-favorite cartoonists and enjoy the festivities! I hope to see you there! Forgot to mention earlier…I’ll (hopefully) have a NEW issue of Tortilla, Tortilla #5 to premiere at this event, so come on down! 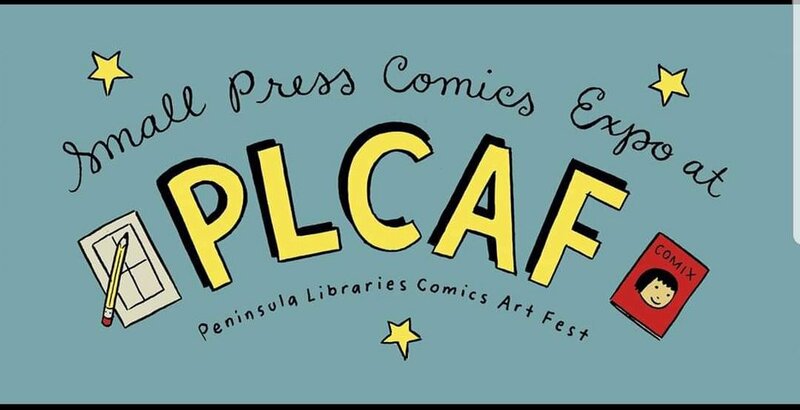 Yes, I will be attending the Small Press Expo at PLCAF (Peninsula Comics Arts Fest) 2019 in Foster City, CA. on Saturday, February 2 at the Foster City Library from 10:00 am until 4:00 pm. Come on by and holla’ at ya boy. There will be tons of cool stuff there to buy and look at. Hope to see you. I had a great time at the BCAF 2019 at the Metreon today in San Francisco. Big thanks to John Jennings and company for having such a great event and met A LOT of great people. I look forward to doing this again. Not much to show or talk about the past month. Same old, same old…which is fine with me. I hope that everyone had a great holiday season. Things are humming along here at the Corn Tortilla World Headquarters (see photo) as I’m trying to close in on completing Tortilla #5 before March, as so I’ll have something new in hand for all of the upcoming expos/cons/fests etc. By March I should be well back into the graphic novel. 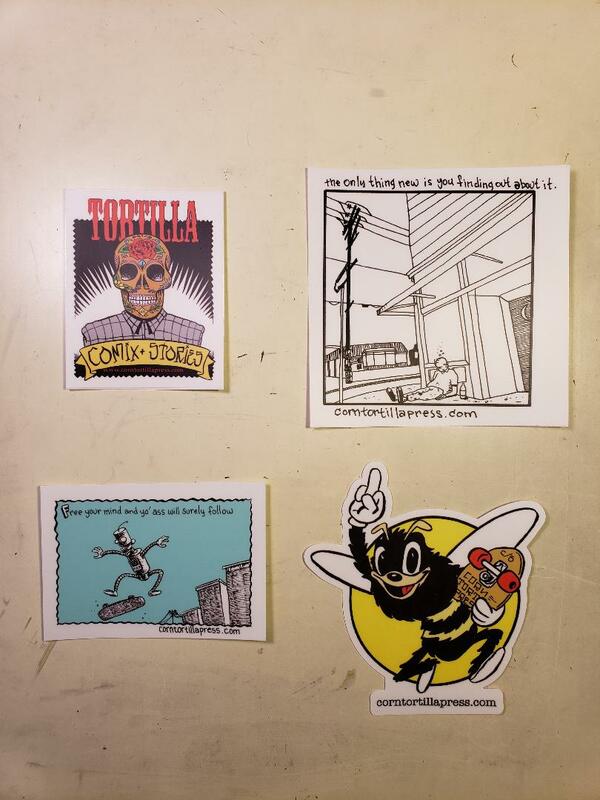 I have four (4) types of vinyl stickers available now and they can be obtained through this website. I’m thinking that for only $10 (that price includes the postage paid) I will send you to your place of mail reception a signed comic book AND all four (4) stickers. Pretty cool dealio. Like most folks I’m stuck indoors during this horrible apocalyptic situation that has its grip on my beloved home state (thoughts going out to the people of Paradise, CA). The only (extremely small) upside to being a recent shut in is the work I can complete instead of being distracted by all of the other shenanigans I tend to be involved with. At the moment I am attempting to complete illustration jobs, continue with the completion of the next issue of Tortilla (issue #5) and forge ahead on my graphic novel, Turk Street Serenade However, I’m still being distracted by other “little things” I’ve been meaning to get to such as a couple of new sticker designs (see picture). So, between the betweens I’ve managed to get the “other things” checked off as well.